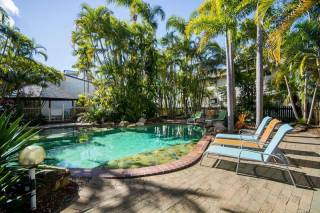 Our one and two bedroom apartments are just perfect for your Hervey Bay holiday. 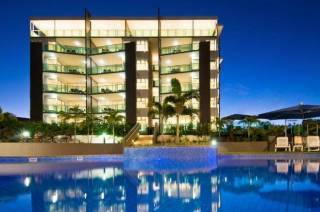 Santalina on Hervey Bay enjoys a perfect beachfront position and most apartments have amazing views of the ocean. Urangan Pier is just a short stroll away and is perfect for a spot of fishing. There is a good variety of restaurants and take-aways within easy walking distance. Our apartments are fully self-contained and self-catering. They have a full well-equipped kitchen, private laundry, air conditioning, all linen is provided and there is secure under-cover parking for one vehicle per apartment. Tour bookings at the front desk. Check in is after 2.00pm. Office hours are: Monday to Friday 8.30am - 5.00pm, 8.30am - 4.00pm Saturday and 9.00am - 12.00pm Sunday and public holidays. Our reception office is closed Christmas Day and selected other public holidays. If you expect to arrive outside office hours, please contact us prior to arrange access to your apartment. From Maryborough, follow the Maryborough - Hervey Bay Road, turning right at the River Heads (Booral Road) round-about. Stay on this road until you reach the ocean! Turn right and Santalina on Hervey Bay is just 300m on your right. There’s a lot more than just the whales! Many people thing of us as just a place to go whale watching but there are plenty of things to do in Hervey Bay that will keep you occupied for days. From July to the end of October is whale watching season and while many other places offer whale watching tours no one can deliver the same experience as we do. There are over 11,000 whales that visit the waters of Hervey Bay every year and these whales aren’t just passing through. This is where they rest up before they start their annual migration back to the colder waters of Antarctica. So you get to see the whales when they have time to play … and you will see lots of whales and they will want to see you. There are a range of whale watching tours available and we can book you onto the tour that best suits your requirements with pick up and return right at our front door. If your list of things to do in Hervey Bay include at least one adrenalin rush then think about sky diving with experienced instructors over the Great Sandy Straight and coming in for a soft touch-down on the beach here in Hervey Bay. It’s not for the faint-hearted but if 90 year old grandmothers can do it then what’s holding you back? Something else on the list of things to do in Hervey Bay that will fire up your adrenalin glands is a jet ski tour to Fraser Island. You don’t need a licence as long as you’re with a guided tour and you’ll see parts of Fraser Island that others miss. And if you would rather take a more relaxed tour of Fraser Island we can book you on a variety of tours that will show you the beauty of that magnificent sand island. It’s the biggest sand island in the world and it features trees that are centuries old and creeks that so crystal clear you can be fooled into thinking that there’s no water in them at all. … a lot more things to do in Hervey Bay. There are sailing tours, fishing charters, a water ski park, safe beaches for swimming, cafes and restaurants that feature some of the best food you will ever taste. There’s kite surfing, snorkeling, stand up paddle boards and sunrises and sunsets that will take your breath away and still more. So what are you waiting for? With so many things to do in Hervey Bay you should plan to spend more than just a few nights here.